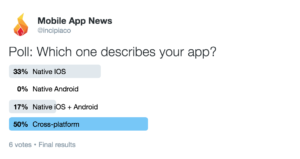 Twitter Poll – Is Your App Native or Cross-Platform? We had a small sample size (6), but in looking at the respondents' answers, it was interesting to see that three indicated their apps were cross-platform. Relying on a 3rd party (from a simple framework to an entire cross-platform language such as Facebook's React Native or RubyMotion) comes with a set of risks that don't exist for native apps, which individuals and companies should be aware of and can cause harm to a company trying to scale a business and create their own IP. IP implications for using 3rd party software. 3rd party software is sometimes purchased by larger companies and either no longer supported (e.g. Facebook Parse) or even shut down. 3rd party software can move from free to paid, incurring unexpected costs. Cross-platform software will undergo some period of time after a new update is released (e.g. iOS 10), before being updated to be compatible with the latest changes, which can cause disruptions at each new release. These languages also rely on hoards of dispersed users for supporting, updating and expanding the codebase, as compared to 1st party languages, whose owners have the highest possible vested interest in ensuring the code works well and that there are plenty of development resources/documentation available to developers. The user experience for cross-platform apps will not be as custom when compared to a native app. The point is to make one app that can support multiple platforms, and as such cross-platform must play to a common denominator between platforms, rather than leveraging the native abilities and design patterns which produce a better user experience. The more technology you integrate, the more moving parts there are and the more chance exists for things to go awry and for troubleshooting to be difficult when they do go awry. German cars such as BMWs look and work great; until they don't. Then it's an extreme expense to resolve the issue. While comparing cross-platform and native languages to cars is apples and oranges, it simply illustrates the point that there are specialized, complex issues which may arise, and which may be more problematic to troubleshoot as compared to those found in a native language. The simple majority of respondents said that organic (ASO, social, email, SEO) was their top performing app marketing channel, with one response each clocking in for ads, PR/influencer and no marketing whatsoever. This seems to shake out with the common process of creating brand awareness through channels such as PR/good product/ads, which then starts to spin the organic flywheel, and is the ROI from that initial investment. We may ask a follow-up question next month to see how app teams gained their initial momentum, and see how many were organic-only from the start. It's likely that the percentage of organic-only teams has been declining period over period, due to the ratcheting up of competition in general (2 million apps), new marketing methods (e.g. Apple search ads) and the continued dearth of organic app discoverability options. The response to this question is fascinating when compared to question #1 (while possibly suspect to sample bias, as most subscribers are interested in marketing). While most teams currently see organic, non-paid efforts as their best performers, the significant majority would choose to invest new resources in paid marketing. This suggests that, while most teams see organic as their top performer, these teams don't see this as an advantageous position, given they would invest to try to gain results outside of the organic sphere. Also interesting was the fact that no respondents would consider new technologies or features, inferring a generalization that either they A) are happy with the way their product is operating or B) are more concerned with the rising competition for new app users, and see filling the top of their funnels with more users as a priority (acquisition vs activation/retention/referral/revenue), lest they be left behind and lose rankings. This is in contrast with the direction that Adam Lovallo sees and urges app teams to move towards (though 2/7 respondents did say they would hire new people, yet without specifics on which roles). That said, it's also entirely possible that $100k is not enough to hire or invest in new features, in the age of high salaries and the job seeker's market in mobile. While there admittedly may also have been a bit of sampling bias in this one ;), there were a few other sources of news besides Incipia that respondents pointed to as being very helpful, including Mobile Dev Memo and Grow.co.